Scott Walls has worked with the most challenging kids in both school and clinical settings and is eager to share his knowledge and expertise with you! You will leave this seminar with tools to use tomorrow to turn your most challenging kids around and create a classroom climate that encourages school success! Explore common behavioral episodes that challenge educators, administrators, & professionals and characterize how these differences inform your choice of intervention. Analyze clinical mental health disorders such as ODD, ADHD, anxiety and depression and address their impact on student behavior in the classroom. 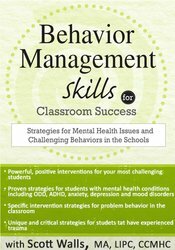 Implement school-based intervention strategies to enhance behavioral skills in in the classroom. Develop effective verbal skills that increase compliant behavior in the classroom, including praise, corrective measures and reciprocal reactions to student behavior problems. Assess components of behavioral escalation and recommend intervention strategies to address each stage. Utilize protective techniques for classroom design in order to create a climate of physical and emotional safety and success. Develop effective crisis interventions plans that address significant behavior concerns, including aggression, self-harm, and suicidal ideation. Scott D. Walls, MA. LIPC, CCMHC, is a mental health counselor in private practice in Lincoln, NE, and has previously spent 15 years with the Lincoln Public Schools as a behavior specialist and psychotherapist. Scott has provided therapy and consultation services for hundreds of children, teens and families in the Lincoln area. In addition, Scott has provided numerous trainings for teachers, administrators and case management staff for various agencies. He is also the author of Oppositional, Defiant & Disruptive Children and Adolescents (PESI, 2016) and Behavior Management Skills Guide with Deb Rauner (PESI, 2015). Scott enjoys providing information to students and participants in a relaxed, learning environment and makes every attempt to give participants practical and down to earth, educational information. Financial: Scott Walls maintains a private practice. He receives a speaking honorarium from PESI, Inc. Non-financial: Scott Walls is a member of the National Board for Certified Counselors. PESI, Inc. is an AOTA Approved Provider of continuing education. Provider #: 3322. This self-study course qualifies for 6.0 self-study contact hours or .6 CEUs in the Category of Domain of OT and Occupational Therapy Process. The assignment of AOTA CEUs does not imply endorsement of specific course content, products, or clinical procedures by AOTA. Course Level: Intermediate. Expires: 5/8/2020. This self-study course consists of 6.25 clock hours of instruction that is applicable for physical therapists. CE requirements for physical therapists vary by state/jurisdiction. Please retain the certificate of completion that you receive and use as proof of completion when required. California Physical Therapists & Physical Therapist Assistants: PESI, Inc. is recognized by the Physical Therapy Board of California as an approval agency to approve providers. This self-study lecture qualifies for 6.25 continuing competency hours. New York Physical Therapists & Physical Therapist Assistants: PESI, Inc. is recognized by the New York State Education Department, State Board for Physical Therapy as an approved provider for physical therapy and physical therapy assistant continuing education. This self-study course qualifies for 7.6 contact hours. Texas Physical Therapists & Physical Therapist Assistants: This self-study activity is provided by the Texas Board of Physical Therapy Examiners Accredited Provider #2106032TX and meets continuing competence requirements for physical therapist and physical therapist assistant licensure renewal in Texas. This activity will provide 6.25 CCUs. The assignment of Texas PT CCUs does not imply endorsement of specific course content, products, or clinical procedures by TPTA or TBPTE. Full attendance is required; no partial credits will be offered for partial attendance. This course is offered for .6 ASHA CEUs (Intermediate level, Professional area). **ASHA CEUs are available on this course from 06/01/2018 to 05/31/2021. PESI, Inc. will submit ASHA CEU Requests to the ASHA CE Registry on a monthly basis; ASHA CEU Requests received before 06/01/2018 or after 05/31/2021 cannot be reported.